THE TWENTIETH CENTURY, which began with the presumption of imagining itself the most enlightened of all ages, has in reality proceeded of imagining some of the blackest years of all human history. Symptomatic of this truly dark age is the revival in recent decades of interest and active participation in witchcraft and sorcery. Much of this interest is on the level of dilettantism and crude amateurism, but more and more often it produces real results, leads to an actual contact with demonic powers, and causes the eternal damnation of souls caught in the web of nets far more subtle and deadly than the beginning occultist imagines. All this is not new to Orthodox Christians. In the history of the world's religions there is a whole tradition of sorcery—the service of the pagan gods, which are demons (Psalm 95:5). This is the religious tradition which Christianity replaced in all lands that accepted the Gospel, and which now comes back in power to destroy Christianity and to conduct mankind to Antichrist. The Life of Sts. Cyprian and Justina gives one of the fullest accounts in Christian literature of sorcery and its power over men—and its final defeat by the power of Christ. It is not the product of someone's imagination, but is based on the first-hand testimony of one who was a leading servant of the demons himself. 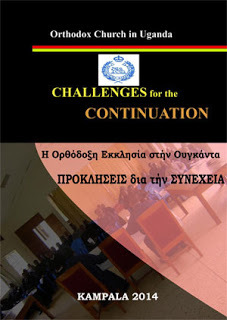 Let Orthodox Christians read and become sober, and resolve with the more firmness and determination to work out their salvation against the powers of darkness in fear and trembling. And let him who has in his heart even a spark of repentance take courage and hope, for this Life is also the surest proof that God's mercy is stretched out even to the most lost of souls. 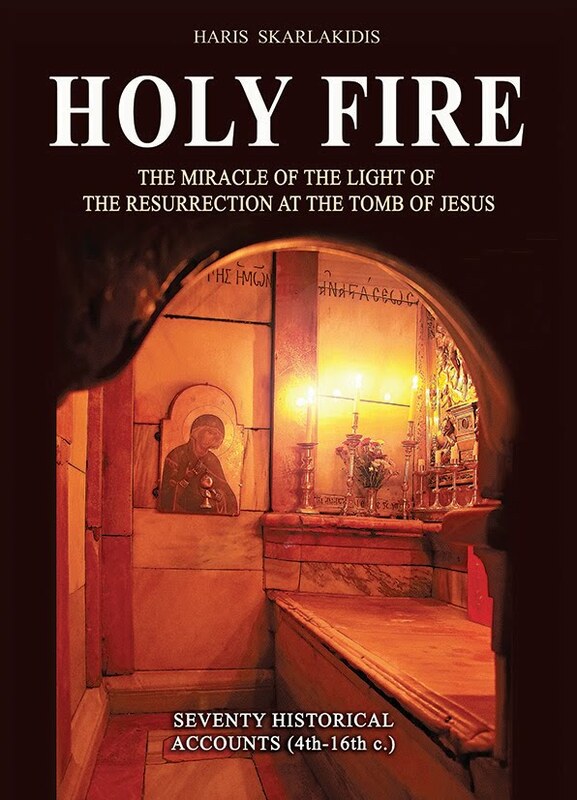 If the sorcerer Cyprian could be saved and become a mighty intercessor for the demon possessed, then there is hope for those also who even now have fallen into the darkest and most unnatural sins of our dark age. 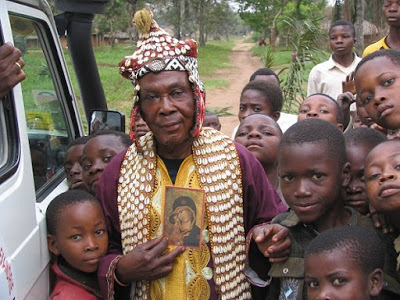 A former magician from Democratic Republic of the Congo, who was converted to Orthodoxy, to the truly Church of Jesus Christ (photo from here). Glory to God! the Master, the Lover of mankind,* that He may save our souls. IN THE REIGN of Decius (249-251) there lived in Antioch (of Pisidia) a certain philosopher and renowned sorcerer whose name was Cyprian, a native of Carthage. Springing from impious parents, in his very childhood he was dedicated by them to the service of the pagan god Apollo. At the age of seven he was given over to magicians for the study of sorcery and demonic wisdom. At the age of ten he was sent by his parents, as a preparation for a sorcerer's career, to Mount Olympus, which the pagans called the dwelling of the gods. Here there were a numerous multitude of idols, in which demons dwelled. On this mountain Cyprian studied all manner of diabolical arts: he mastered various demonic transformations, learned how to change the nature of the air, to bring up winds, produce thunder and rain, disturb the waves of the sea, cause damage to gardens, vineyards and fields, to send diseases and plagues upon people; and in general he learned a ruinous wisdom and diabolical activity filled with evil. In this place he saw a numberless legion of demons, with the prince of darkness at their head; some stood before him, others served him, still others cried out in praise of their prince, and some were sent into the world in order to corrupt people. Here he likewise saw in their false forms the pagan gods and goddesses, and also diverse phantoms and specters, the invocation of which he learned in a strict forty-day fast. He ate only after the setting of the sun, and not bread or anything else, but only acorns from oak trees. When he was fifteen years old he began to receive lessons from seven great sorcerers; from them he learned many demonic secrets. Then he went to the city of Argos, where, having served the goddess Juno for a time, he learned many practices of deception from her priests. 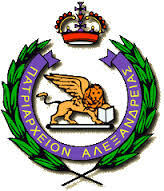 He lived also in Taurapolis (on the island of Icara) in the service of the goddess Diana; and from there he went to Sparta, where he learned how to call forth the dead from the graves and to force them to speak by means of various incantations and spells. At the age of twenty, Cyprian came to Egypt, and in the city of Memphis he learned yet greater charms and incantations. In his thirtieth year he went to the Chaldeans, and having learned astrology there, he finished his studies. After this he returned to Antioch, being perfect in all evil-doing. Thus he became a sorcerer, magician, and destroyer of souls, a great friend and faithful slave of the prince of hell, with whom he conversed face to face, being vouchsafed to receive from him great honor, as he himself testified. "Believe me," he said; "I have seen the prince of darkness himself, for I propitiated him by sacrifices. I greeted him and spoke with him and his ancients; he liked me, praised my understanding, and before everyone said: 'Here is a new Jambres, always ready for obedience and worthy of communion with us!' And he promised to make me a prince after my departure from the body, and for the course of earthly life to help me in everything. And he gave me a legion of demons to serve me. When I departed from him, he addressed me with these words: 'Take courage, fervent Cyprian; arise and accompany me; let all the demonic ancients marvel at you.' Consequently, all of his princes also were attentive to me, seeing the honor shown to me. The outward appearance of the prince of darkness was like a flower. His head was crowned by a crown (not an actual, but a phantom one) made of gold and brilliant stones, as a result of which the whole space around him was illuminated; and his clothing was astonishing. When he would turn to one or the other side, that whole place would tremble; a multitude of evil spirits of various degrees stood obediently at his throne. I gave myself over entirely into his service at that time, obeying his every command." Thus did St. Cyprian relate of himself after his conversion. From this it is evident what kind of man Cyprian was: as a friend of the demons, he performed all their works, causing evil to people and deceiving them. Living in Antioch, he turned many people away to every kind of lawless deed; he killed many with poisons and magic, and slaughtered young men and maidens as sacrifices for the demons. He instructed many in his ruinous sorcery: some he taught to fly in the air, others to sail in boats on the clouds, still others to walk on water. By all the pagans he was revered and glorified as a chief priest and most wise servant of their vile gods. Many turned to him in their needs, and he helped them by means of the demonic power with which he was filled: with some he cooperated in their adulteries, with others in anger, enmity, revenge, jealousy. Already he was entirely in the depths of hell and in the jaws of the devil; he was a son of gehenna, a partaker of the demonic inheritance and of their eternal perdition. But the Lord, who does not desire the death of a sinner, in His unutterable goodness and His mercy which is not conquered by the sins of men, deigned to seek out this lost man, to draw out of the abyss one who was mired in the filth of the depths of hell, and to save him in order to show to all men His mercy; for there is no sin which can conquer His love of mankind. He saved Cyprian from perdition in the following way. THERE LIVED AT THAT TIME in Antioch a certain maiden whose name was Justina. She came from pagan parents; her father was a priest of the idols, Aedesius by name, and her mother was called Cledonia. Once, sitting at the window of her house, this maiden, who had then already reached womanhood, by chance heard the words of salvation out of the mouth of a deacon who was passing by, whose name was Praylius. He spoke of our Lord Jesus Christ's becoming man, that He had been born of the Most Pure Virgin and, having performed many miracles, had deigned to suffer for the sake of our salvation, had risen from the dead with glory, ascended into the heavens, and sits at the right hand of the Father and reigns eternally. This preaching of the deacon fell on good soil, into the heart of Justina, and began quickly to bring forth fruit, uprooting in her the thorns of unbelief. 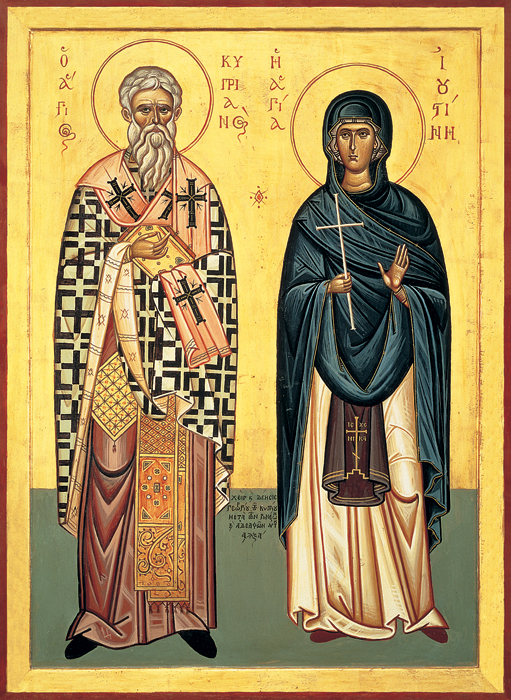 Justina wished to be instructed in the Faith by this deacon better and more completely, but she did not dare to seek him out, being restrained by a maiden's modesty. However, she secretly went to the church of Christ, and often hearing the word of God, with the Holy Spirit acting in her heart, she came to believe in Christ. Soon she convinced her mother of this also, and then brought to the faith her aged father as well. Seeing the understanding of his daughter and hearing her wise words, Aedesius reflected within himself thus: "The idols are made by the hands of men and have neither soul nor breath, and therefore how can they be gods?" While he was reflecting on this, once at night he saw during sleep, by Divine consent, a wondrous vision: he saw a great multitude of light-bearing Angels, and in their midst was the Saviour of the world, Christ, Who said to him: "Come to Me, and I will give you the Kingdom of Heaven." After rising in the morning, Aedesius went with his wife and daughter to the Christian Bishop, whose name was Optatus, begging him to instruct them in the Faith of Christ and to perform upon them holy Baptism. At the same time he informed him of the words of his daughter and of the angelic vision which he had seen himself. 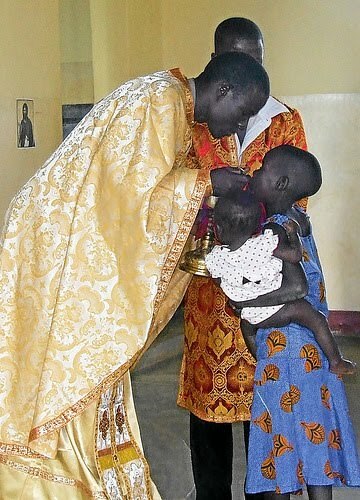 Hearing this, the Bishop rejoiced at their conversion, and having instructed them in the Faith of Christ, he baptized Aedesius, his wife Cledonia, and their daughter Justina; and then, having given them communion of the Holy Mysteries, he let them go in peace. When Aedesius had become strengthened in the Faith of Christ, the Bishop, seeing his piety, made him a presbyter. After this, having lived virtuously and in the fear of God for a year and six months, Aedesius in holy faith came to the end of his life. 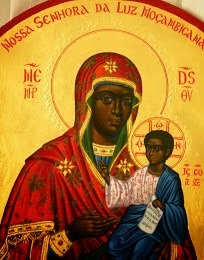 As for Justina, she valiantly struggled in the keeping of the Lord's commandments, and having come to love her Bridegroom Christ, she served Him with fervent prayers, in virginity and chastity, in fasting and great abstinence. But the enemy, the hater of the human race, seeing such a life, envied her virtues and began to do harm to her, causing various misfortunes and sorrows. AT THAT TIME there lived in Antioch a certain youth named Aglaias, the son of wealthy and renowned parents. He lived luxuriously, giving himself entirely over to the vanity of this world. Once he saw Justina as she was going to church, and he was struck by her beauty. The devil instilled shameful intentions into his heart. Being inflamed with lust, Aglaias by all means strove to gain the good disposition and love of Justina and by means of deception to bring the pure lamb of Christ to the defilement which he planned. He observed all the paths by which the maiden would walk, and, meeting her, would speak to her cunning words, praising her beauty and glorifying her; showing his love for her, he strove to draw her into fornication by a cunningly-woven net of deceptions. The maiden, however, turned away from him and fled from him, despising him and not desiring even to hear his deceptive and cunning speeches. But the youth did not grow cool in his desire of her beauty, and he sent to her the request that she should agree to become his wife. 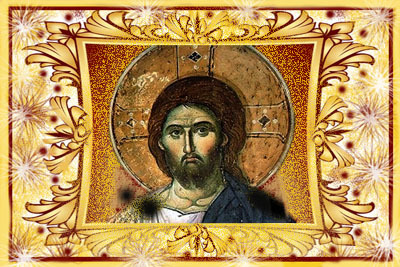 She, however, replied to him: "My Bridegroom is Christ; Him I serve, and for His sake I preserve my purity. He preserves both my soul and my body from every defilement." Hearing such a reply from the chaste maiden, Aglaias, being instigated by the devil, became yet more inflamed with passion. Not being able to deceive her, he intended to seize her by force. Having gathered to his aid some foolish youths like himself, he waylaid the maiden in the path along which she usually walked to church for prayer; there he met her and, seizing her, began dragging her by force to his house. But she began loudly to scream, beat him in the face, and spat on him. The neighbors, hearing her wails, ran out of their houses and took the immaculate lamb, St. Justina, from the hands of the impious youth as from the jaws of a wolf. The disorderly youths scattered, and Aglaias returned with shame to his house. Not knowing what more to do, he decided, with the increase of impure lust in him, upon a new evil deed: he went to the great sorcerer and magician Cyprian, the priest of the idols, and having informed him of his sorrow, begged his help, promising to give him much gold and silver. Having heard out Aglaias, Cyprian comforted him, promising to fulfill his desire. "I will so manage," he said, "that the maiden herself will seek your love and will feel passion for you even stronger than that which you have for her." Having thus consoled the youth, Cyprian let him go, full of hope. Then, taking the books of his secret art, he invoked one of the impious spirits who, he was sure, could soon inflame the heart of Justina with passion for this youth. The demon willingly promised to fulfill this and proudly said: "This deed is not difficult for me, because many times I have shaken cities, crumbled walls, destroyed houses, caused the shedding of blood and patricide, instilled hatred and great anger between brothers and spouses, and have brought to sin many who have given a vow of virginity. 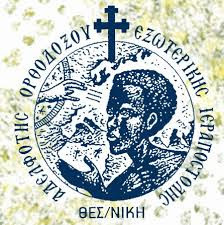 In monks who have settled in mountains and were accustomed to strict fasting and have never even thought about the flesh, I have instilled adulterous lust and instructed them to serve fleshly passions; people who have repented and turned away from sin, I have converted back to evil deeds; many chaste people I have thrown into fornication. Will I really be unable to incline this maiden to the love of Aglaias? Indeed, why do I speak? I will swiftly show my powers in very deed. Take this powder" (here he gave him a vessel full of something) "and give it to this youth; let him sprinkle the house of Justina with it, and you will see that what I have said will come to pass." Having said this, the demon vanished. Cyprian called Aglaias and sent him to sprinkle the house of Justina secretly with the contents of the demon's vessel. When this had been done, the demon of fornication entered the house with the flaming arrows of fleshly lust in order to wound the heart of the maiden with fornication, and to ignite her flesh with impure lust. Justina had the custom every night to offer up prayers to the Lord. And behold, when, according to custom, she arose at the third hour of the night and was praying to God, she suddenly felt an agitation in her body, a storm of bodily lust and the flame of the fire of gehenna. In such agitation and inward battle she remained for quite a long time; the youth Aglaias came to her mind, and shameful thoughts arose in her. The maiden marveled and was ashamed of herself, feeling that her blood was boiling as in a kettle; now she thought about that which she had always despised as vile. But in her good sense Justina understood that this battle had arisen in her from the devil; immediately she turned to the weapon of the sign of the cross, hastened to God with fervent prayer, and from the depths of her heart cried out to Christ her Bridegroom: "O Lord, my God, Jesus Christ! Behold how many enemies have risen up against me and have prepared a net in order to catch me and take away my soul. But I have remembered Thy name in the night and have rejoiced, and now when they are close about me I hasten to Thee and have hope that my enemy will not triumph over me. For thou knowest, O Lord my God, that I, Thy slave, have preserved for Thee the purity of my body and have entrusted my soul to Thee. Preserve Thy sheep, O good Shepherd; do not give it over to be eaten by the beast who seeks to devour me; grant me victory over the evil desire of my flesh." Having prayed long and fervently, the holy virgin put the enemy to shame. Being conquered by her prayer, he fled from her with shame, and again there came a calm in Justina's body and heart; the flame of desire was quenched, the battle ceased, the boiling blood was stilled. Justina glorified God and sang a song of victory. The demon, on the other hand, returned to Cyprian with the sad news that he had accomplished nothing. Cyprian asked him why he had not been able to conquer the maiden. The demon, even against his will, revealed the truth: "I could not conquer her because I saw on her a certain sign of which I was afraid." Then Cyprian called a yet more malicious demon and sent film to tempt Justina. He went and did much more than the first one, falling upon the maiden with great rage. But she armed herself with fervent prayer and laid upon herself yet a more powerful labor: she clothed herself in a hair shirt and mortified her flesh with abstinence and fasting, eating only bread and water. Having thus tamed the passions of her flesh, Justina conquered the devil and banished him with shame. And he, like the first one, returned to Cyprian without accomplishing anything. Then Cyprian called one of the princes of the demons, informed him about the weakness of the demons he had sent, who could not conquer a single maiden, and asked help from him. This prince of demons severely reproached the other demons for their lack of skill in this matter and for their inability to arouse passion in the heart of the maiden. Having given hope to Cyprian and promised to seduce the maiden by other means, he took on the appearance of a woman and went to Justina. And he began to converse piously with her, as if desiring to follow the example of her virtuous life and her chastity. Conversing in this way, he asked the maiden what kind of reward there might be for such a strict life and for the preservation of purity. Justina replied that the reward for those who live in chastity is great and beyond words, and that it is very remarkable that people do not in the least concern themselves for such a great treasure as angelic purity. Then the devil, revealing his shamelessness, began with cunning words to tempt her, saying: "But then how could the world exist? How would people be born? After all, if Eve had preserved her purity, how would the human race have increased? In truth marriage is a good thing, being established by God Himself; the Sacred Scripture also praises it, saying: Let marriage be had in honor among all, and the bed undefiled (Heb. 13:4). 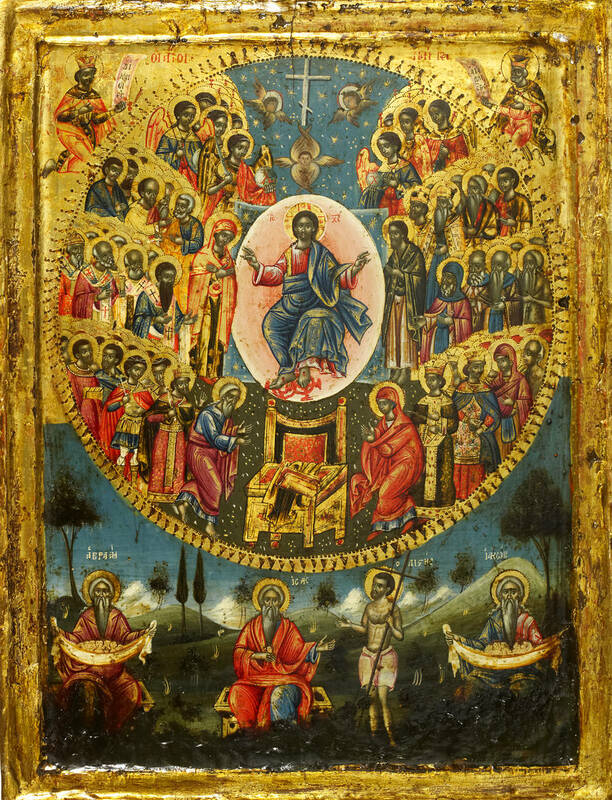 And many saints of God also did they not enter into marriage, which God gave them as a consolation, so that they might rejoice in their children and praise God?" Hearing these words, Justina recognized the cunning deceiver, the devil, and, more skillful than Eve, conquered him. Without continuing this conversation, she immediately fled to the defense of the Cross of the Lord and placed its honorable sign on her forehead; and her heart she turned to Christ her Bridegroom. And the devil immediately vanished with yet greater shame than the first two demons. In great disturbance, the proud prince of the demons returned to Cyprian, who, finding out that he had not managed to do anything, said to him: "Can it be that even you, a prince powerful and more skillful than others in such matters, could not conquer the maiden? Who then among you can do anything with this unconquerable maiden's heart? Tell me by what weapon she battles with you, and how she makes powerless your mighty power?" Being conquered by the power of God, the devil unwillingly acknowledged: "We cannot behold the sign of the Cross, but flee from it, because it scorches us like fire and banishes us far away." Cyprian became angry at the devil because he had put him to shame, and reproaching the demon, he said: "Such is your power that even a weak virgin conquers you!" Then the devil, desiring to console Cyprian, attempted yet another undertaking: he took on the form of Justina and went to Aglaias with the hope that, having taken him for the real Justina, the youth might satisfy his desire, and thus neither would the weakness of the demons be revealed, nor would Cyprian be put to shame. And behold, when the demon went to Aglaias in the form of Justina, the youth leaped up in unspeakable joy, ran to the false maiden, embraced her and began kissing her, saying: "How good it is that you have come to me, fair Justina!" But no sooner had the youth pronounced the word "Justina" than the demon immediately disappeared, being unable to bear even the name of Justina. The youth became greatly afraid and, running to Cyprian, told him what had happened. Then Cyprian by his sorcery gave him the form of a bird and, having enabled him to fly in the air, he sent him to the house of Justina, advising him to fly into her room through the window. Being carried by a demon in the air, Aglaias flew on the roof. At this time Justina happened to look through the window of her room. Seeing her, the demon left Aglaias and fled. At the same time, the phantom appearance of Aglaias also vanished, and the youth, falling down, was all but dashed to pieces. He grasped the edge of the roof with his hands and, holding on to it, hung there; and if he had not been let down to the ground by the prayer of St. Justina, the impious one would have fallen down and been killed. Thus, having achieved nothing, the youth returned to Cyprian and told him of his woe. Seeing himself put to shame, Cyprian was greatly grieved and thought himself of going to Justina, trusting in the power of his sorcery. He turned himself into a woman and into a bird, but he did mpt manage to reach as far as the door of the house of Justina before his false appearances disappeared, and he returned with sorrow. AFTER THIS CYPRIAN began to gain revenge for his shame, and by his sorcery he brought diverse misfortunes on the house of Justina and on the houses of all her relatives, neighbors and friends, as once the devil had done to righteous Job (Job 1:15-19, 2:7). He killed their animals, he struck down their slaves with plagues, and in this way he brought them to extreme grief. Finally, he struck with illness Justina herself, so that she lay in bed and her mother wept over her. Justina, however, comforted her mother with the words of the Prophet David: I shall not die, but live, and I shall tell of the works of the Lord (Psalm 117:17). Not only on Justina and her relatives, but also on the whole city, by God's allowance, did Cyprian bring misfortune as a result of his untamable rage and his great shame. Plagues appeared in the animals and various diseases among men; and the rumor spread, through the activity of the demons, that the great sorcerer Cyprian was punishing the city for Justina's opposition to him. Then the most honorable citizens went to Justina and with anger tried to persuade her not to grieve Cyprian any longer, and to become the wife of Aglaias, in order to escape yet greater misfortunes for the whole city because of her. But she calmed them by saying that soon all the misfortunes which had been brought about with the help of Cyprian's demons would cease. And so it happened. When St. Justina prayed fervently to God, immediately all the demonic attacks ceased; all were healed from the plagues and recovered from their diseases. When such a change occurred, the people glorified Christ and mocked Cyprian and his sorcerer's cunning, so that from shame he could not show himself among men and he avoided meeting even friends. Having become convinced that nothing could conquer the power of the sign of the cross and the name of Christ, Cyprian came to his senses and said to the devil: "O destroyer and deceiver of all, source of every impurity and defilement! Now I have discovered your infirmity. For if you fear even the shadow of the cross and tremble at the name of Christ, then what will you do when Christ Himself comes to you? If you cannot conquer those who sign themselves with the sign of the cross, then whom will you tear away from the hands of Christ? Now I have understood what a non-entity you are; you are not even able to take revenge! Listening to you, 1, wretched one, have been deceived, and I believed your tricks. Depart from me, accursed one, depart! For I must entreat the Christians that they might have mercy on me. I must appeal to pious people, that they might deliver me from perdition and be concerned over my salvation. Depart, depart from me, lawless one, enemy of truth, adversary and hater of every good thing!" Having heard this, the devil threw himself on Cyprian in order to kill him; attacking him, he began to beat and strangle him. Finding no defense anywhere, and not knowing how to help himself and be delivered from the fierce hands of the demon, Cyprian, already scarcely alive, remembered the sign of the cross, by the power of which Justina had opposed all the demons' power, and he cried out: "O God of Justina, help me!" Then, raising his hand, he made the sign of the cross, and the devil immediately leaped away from him like an arrow shot from a bow. Gaining courage, Cyprian became bolder, and calling on the name of Christ, he signed himself with the sign of the cross and stubbornly opposed the demon, cursing and reproaching him. As for the devil, standing far away from him and not daring to draw near to him out of fear of the sign of the cross and the name of Christ, he threatened Cyprian in every manner, saying: "Christ will not deliver you out of my hands!" Then, after long and fierce attacks on Cyprian, the demon roared like a lion and went away. THEN CYPRIAN took all his books of magic and went to the Christian Bishop Anthimus. Falling to the feet of the Bishop, he entreated him to have mercy on him and to give him holy Baptism. Knowing that Cyprian was a great sorcerer, feared by all, the Bishop thought that he had come to him with some kind of trick, and therefore he refused him, saying: "You do much evil among the pagans; leave the Christians in peace, lest you speedily perish." Then Cyprian with tears confessed everything to the Bishop and gave him his books to be burned. 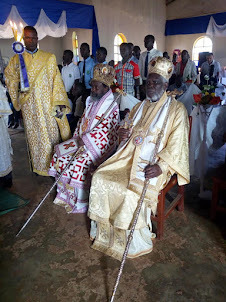 Seeing his humility, the Bishop instructed him and taught him the holy faith, and then commanded him to prepare for Baptism; and his books he burned before all the believing citizens. Leaving the Bishop with a contrite heart, Cyprian wept over his sins, sprinkled ashes on his head, and sincerely repented, calling out to the true God for the cleansing of his iniquities. Coming the next day to church, he heard the word of God with joyful emotion, standing among the believers. And when the deacon commanded the catechumens to go out, declaring: "Ye catechumens depart," and certain ones were already going out, Cyprian did not wish to go out, saying to the deacon: "I am a slave of Christ; do not chase me out of here." 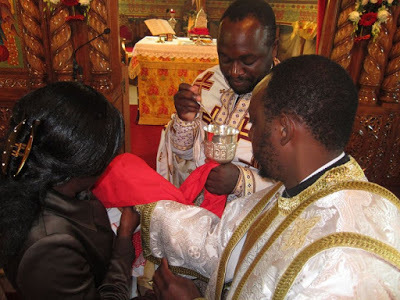 But the deacon said to him: "Since you have not yet been given holy Baptism, you must go out of the church." To this Cyprian replied: "As Christ my God I liveth, Who has delivered me from the devil, Who has preserved the maiden Justina pure, and has had mercy on me—you will not chase me out of the church until I become a complete Christian." The deacon related this to the Bishop, and the Bishop, seeing the fervor of Cyprian and his devotion to the faith of Christ, called him up and immediately baptized him in the name of the Father and the Son and the Holy Spirit. Finding out about this, St. Justina gave thanks to God, distributed much alms to the poor, and made an offering in church. And Cyprian, on the eighth day after his Baptism, was made a reader by the Bishop; on the twentieth day he was made subdeacon, and on the thirtieth day a deacon; and in a year he was ordained priest. 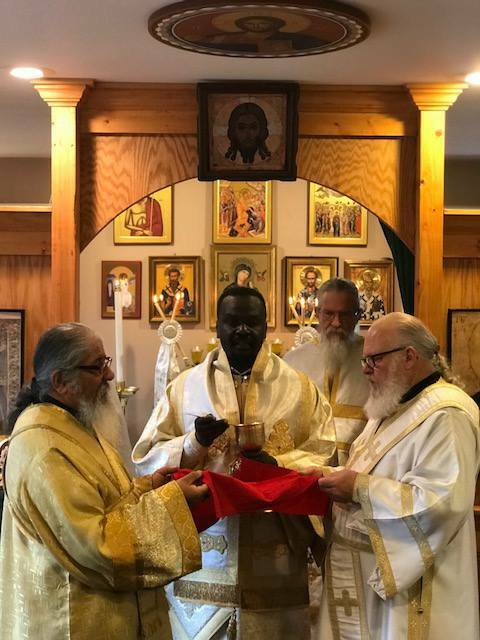 Cyprian completely changed his life; with every day he increased his struggles, and constantly weeping over his previous evil deeds, he perfected himself and ascended from virtue to virtue. Soon he was made Bishop, and in this rank he led such a holy life that he equaled many great saints. At the same time he zealously took care of the flock of Christ which had been entrusted to him. St. Justina the maiden he made a deaconess, and then entrusted to her a convent, making her abbess over other Christian maidens. By his conduct and instruction he converted many pagans and acquired them for the Church of Christ. Thus, idol worship began to die out in that land, and the glory of Christ increased. Seeing the strict life of St. Cyprian, his concern for the faith of Christ and for the salvation of human souls, the devil ground his teeth against him And inspired the pagans to slander him before the governor of the eastern region, saying that he had put the gods to shame, had converted many people away from them, and was glorifying Christ, Who was hostile to their gods. And so, many impious ones came to the governor Eutolmius, who was then governing those regions, and made slanders against Cyprian and Justina, accusing them ,of being hostile to their gods and to the emperor and to all authorities, saying that they were disturbing the people, deceiving them, and leading them in their footsteps, disposing them to worship the crucified Christ. At the same time they asked the governor to give Cyprian and Justina over to death for this. Having heard their request, Eutolmius commanded that Cyprian and Justina be seized and placed in prison. Then, setting out for Damascus, he took them with him in order to make judgment upon them. And when they had brought the prisoners of Christ, Cyprian and Justina, to him, he asked Cyprian: "Why have you changed your earlier glorious way of life, when you were a renowned servant of the gods and brought many people to them?" 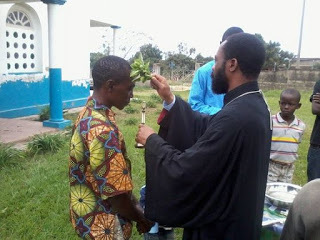 Former magician, now Orthodox Christian, Bunia, DRC (from here). Glory to God! St. Cyprian related to the governor how he had found out the infirmity and the deception of the demons and come to understand the power of Christ, which the demons feared and before which they trembled, disappearing from before the sign of the precious cross; and likewise he explained the reason for his conversion to Christ, for Whom he declared his readiness to die. 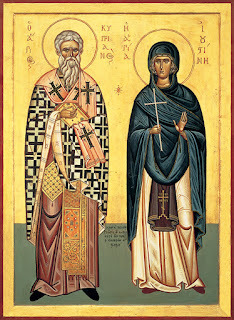 The torturer did not accept the words of Cyprian in his heart, but being unable to reply to them, he commanded that the Saint be hung up and his body scraped, and that St. Justina be beaten on the mouth and eyes. For the whole time of the long torments they ceaselessly confessed Christ and endured everything with thanksgiving. Then the torturer imprisoned them and strove by kind exhortation to return them to idol worship. When he was unable to convince them, he commanded that they be thrown into a cauldron; but the boiling cauldron did not cause them any harm, and they glorified God as if they were in some cool place. Seeing this, one priest of the idols, by name Athanasius, said: "In the name of the god Aesculapius, I also will throw myself into this fire and put to shame those sorcerers." But hardly had the fire touched him than he immediately died. Seeing this, the torturer became frightened, and not desiring to judge them further, he sent the martyrs to the governor Claudius in Nicomedia, describing all that had happened to them. This governor condemned them to be beheaded with the sword. When they were brought to the place of execution, Cyprian asked a little time for prayer, so that Justina might be executed first; he feared that Justina would become frightened at the sight of his death. But she joyfully bent her head under the sword and departed unto her Bridegroom Christ. 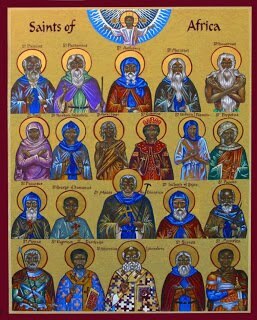 Seeing the innocent death of these martyrs, a certain Theoctistus, who was present there, greatly pitied them and, being inflamed in his heart towards God, he fell down to St. Cyprian and, kissing him, declared himself a Christian. Together with Cyprian he also was immediately condemned to be beheaded. Thus they gave over their souls into the hands of God; their bodies, however, lay for six days unburied. Certain of the strangers who were there secretly took them and brought them to Rome, where they gave them to a certain virtuous and holy woman whose name was Rufina, a relative of Claudius Caesar. She buried with honor the bodies of the holy martyrs of Christ: Cyprian, Justina, and Theoctistus. At their graves many healings occurred for those who came to them with faith. By their prayers may the Lord heal also our afflictions of body and soul! Amen. Translated from the Russian Lives of Saints, Moscow, 1904. The devout maiden R. was subjected to the same temptation as was once the holy Martyr Justina: she was pursued by a certain man who, seeing that all his efforts to arouse in her a mutual love for him remained futile, turned to a sorcerer, and with his help began to direct magic spells against her. Being forewarned about this through a faithful servant-woman, and beginning to feel in herself the action of the enemy's power, this maiden had no one from whom to seek help except God, for she had no acquaintance with anyone of spiritual life. One night the above-mentioned servant-woman saw a dream wherein a tall monk entered her lady's room and led her out in a monastic garment. Soon after this, Elder Anthony of Optina visited this family, although he had not known them before. In this important visit was clearly expressed the providence of God for this family, as well as the manifest activity of demons ... When he entered the house (as he later wrote this maiden), "at first I encountered a whole crowd of demons who with abusive language forbade me to enter, but the Lord drove them away ... Even though I did not know the history of your last two years, it was not for nothing that I advised you to pray to the holy Martyr Justina the virgin, for your situation then was very similar to hers, as I recently found out, and with my whole soul I thank God with tears that your holy soul has been delivered from the nets which had caught it!" The servant-woman, when she saw Father Anthony, recognized that it was precisely he that she had seen in her dream. The Elder understood that the only salvation for this maiden was to go to a convent. But her relatives did not wish even to hear of this, and Father Anthony did not find it possible or profitable to persuade them; and therefore he only prayed for her deliverance from the enemy's nets that surrounded her, and by his letters strengthened her in her torment from the invisible power of demons, which had been brought against her by the sorcerer ... By the prayers of Father Anthony, R's mother unexpectedly gave her consent for her to enter a convent ... However, the sorcerer boasted that he would drag her even out of the convent. And indeed, the young novice continued to feel within herself the action of the enemy's power, having repose neither day nor night; and again she found strength in the prayers and counsel of Father Anthony. The young sufferer received final deliverance from the temptation of the enemy that tormented her through the prayers of the great contemporary hierarch, now reposed, Metropolitan Philaret of Moscow. Once he appeared to her in a dream, read the 60th Psalm, ordered her to repeat after him all the verses of it, and then gave her the command to read this Psalm daily. On awakening, she felt that the temptation which had been tormenting her for many years had completely departed from her. 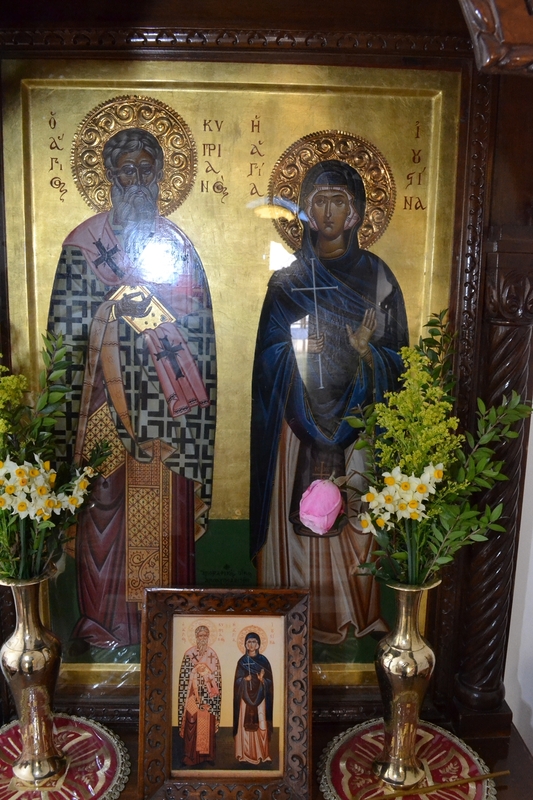 From the time when, by the grace of God, our monastery was founded in 1961, our protectors, Saints Cyprian and Justina, have worked many miracles through their intercession, especially for those suffering from satanic influence or the effects of black magic. A few years ago, after the Sunday Liturgy, while the abbot was still in the altar taking off his vestments, a young man, about 30 years old, came to one of the side doors of the iconostasis and in tears said: "Father, save me, help, my home is falling apart. I have been married 25 days now, but they have done something to me and I can't get close to my wife. We live as brother and sister, and now we're so much in the hold of nerves and quarrelling, that if it continues, we will separate." The abbot tried to calm him, and advised him that when he and his wife had repented of their sins, they should confess, and after fasting three days, they should come to the monastery so that a Vigil and Divine Liturgy could be served in their name. The young man continued: "I asked my father where the old man told him to dig. He showed me, and forty centimeters down I found these strange things." He gave the abbot a white handkerchief with a large knot, which proved when opened to contain the dust of a dead body and the couple's initials. Exorcisms were read over it, and the young man left again. 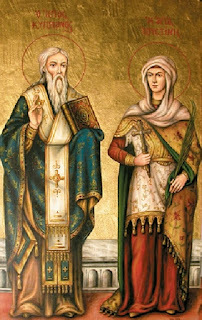 Two days later the abbot saw an old woman kneeling and weeping before the icon of St. Cyprian and St. Justina. When asked what had happened, she replied that she was the mother of the young man from Aspopyrgo, and from the day they had come to the monastery, they had been completely well, and were living in great happiness. She had come to thank the Saints, full of gratitude for the great gift they had given. From The Orthodox Word, Vol. 12, No. 5 (70) (September-October, 1976), pp. 135-142, 167-176. Αναρτήθηκε από ΝΕΚΡΟΣ ΓΙΑ ΤΟΝ ΚΟΣΜΟ στις 4:40 π.μ. A girl who was tortured for three months!